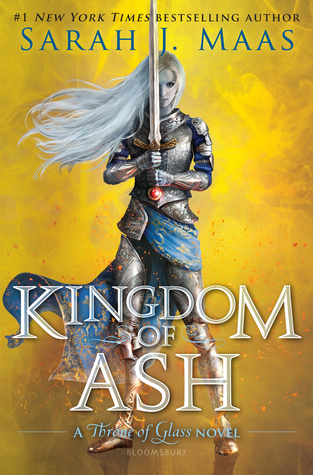 Review in a Nutshell: Kingdom of Ash is a fantastic conclusion to a series that has taken over the YA community. Kingdom of Ash is the final Throne of Glass novel. This book takes place after the events of Empire of Storms and Tower of Dawn and follows an insane amount of characters as the war begins. I think it’s pretty well known that Maas’ writing in the later books has gotten a bit repetitive and much more mature, but I felt that while writing this book she took these complaints to heart. I won’t lie and say it’s absolutely amazing and no line made me cringe, but it was an improvement from Empire of Storms (I’m not comparing it to Tower of Dawnbecause that book was absolutely amazing). The sexier scenes were less detailed and more fade-to-black, which is a lot more appropriate for the YA audience and makes more sense considering the plot. However, if that’s why you loved this series- sorry! The romance aspects are still adorable though! This book had a lot to do, and a lot to live up to. I left it feeling satisfied with the ending, but there were definitely a few plot points and deus ex machinas that pulled me out of the book. Mostly towards the end, there was one specific thing that was so out of nowhere that I got annoyed, and the ending itself was a little too neatly wrapped up for how things were solved. I’ll get into that more in a spoilery section. As for the pacing, this book was relatively fast-paced and engrossing despite being 1000 pages. There were constant battle scenes and action that moved the book along, mixed with some amazing character-defining moments and even a couple lines that made me laugh despite the war and death. After a while, specifically the Lysandra and Aedion chapters did get a little slow and predictable, but the other perspectives made up for it. Also, I want to mention that the first quarter of this book has a lot of graphic torture scenes that can be hard to get through. It’s absolutely brutal and I found myself having to step back from the book a few times. Aelin – She really had a great arc in this book. We’ve seen her grow and develop so much over this series, but this book definitely has the most growth for her. I was getting a little apathetic towards her in Empire of Storms, but in this last novel I really began to feel for her again and care about her. Fenrys – If you asked me, before this book, what I thought about Fenrys, I would probably ask you who you were talking about. That said, after reading Kingdom of Ash, I would die for him. Sarah J. Maas developed him into an amazing character who stole the show for me. Dorian – Dorian was one of my favorite characters in this entire series. I need to start with that, because Dorian in this book was just kinda meh. I think part of it had to do with his relationship with Manon. It just felt forced and unnecessary (and this is coming from someone who loved Manon and shipped them back in Queen of Shadows). Aedion & Lysandra – This is another relationship that lost its adorableness for me. I loved them in the previous books, but Aedion said and did some things that really ruined my love of them as a couple. I still like them together, but I wasn’t excited to see their relationship develop like I was in the previous books. Chaol – What a journey. I’ve gone from hating him, to loving him, and this book just cemented how much I love him now. I loved his interactions with Yrene, and how he defies the trope of overprotective husband and lets her make her own decisions and risk her life if it means saving the world. I just love a healthy relationship. Kingdom of Ash isn’t perfect, but it is a conclusion that fans of the series will adore, and casual readers will still enjoy. Okay I have a lot of thoughts and I want to try to go through them in a way that makes sense, but let’s be real, that’s not gonna happen. Most of the spoilery things are things I’m disappointed with so if you want positivity… sorry? I loved The Thirteen so much, which is why I hate what happened to them. I understand Maas couldn’t let everyone live (more on that later) but why them? The only people who died where them and Gavriel, a.k.a the only people every cared for without heterosexual love interests (and since she tortured Fenrys enough I guess she didn’t want to kill him as well). I cried so hard at their deaths, and then when I stopped crying I was just upset. They deserved a better ending than that. 2. Literally no one who lived could be single or straight. Once again, Fenrys is the exception, but let’s face it. She’s probably going to write a spin-off featuring him and probably ending with him marrying some unnaturally beautiful girl (don’t lie, you know the end of this book sets it up perfectly). 3. (Not a complaint) THAT CROSSOVER!!! Did everyone notice Rhys’ little cameo when Aelin was falling through worlds???? I loved it so much!!!! That Wolf Fae thing at the end. That was just out of nowhere and really unnecessary. It felt wayyy to convenient and just pulled me out of the book. Also, the entire army dying after Erawan died. That felt like another cheap way to wrap up loose ends. I understand why she did it, and it makes some sense, but it did leave me feeling a little bit disappointed. It was anticlimatic. So a lot of people were upset with the ending of ACOWAR, and while SJM clearly did try to kill some people off, it just wasn’t done well. She conveniently killed off those who were paired up so this book could have the happiest ending possible, which just made it seem so unrealistic in a series that has always felt down to earth for a high fantasy, assassin-fae YA series. I just wanted to mention the King of Ardalan. I always wondered why she never gave him a name (I thought she just didn’t like naming Kings because she didn’t name Hybern), and I love how she actually had a reason! I really loved how she handled his and Dorian’s relationship and how Dorian was coping, since we didn’t see much coping in Empire of Storms. Also, I loved the reveal of his name. I was afraid if she did reveal his name it would be disappointing, but it really wasn’t. Just say it out loud a few times. It’s too fun. (Also I love Lorcan and he’s precious).